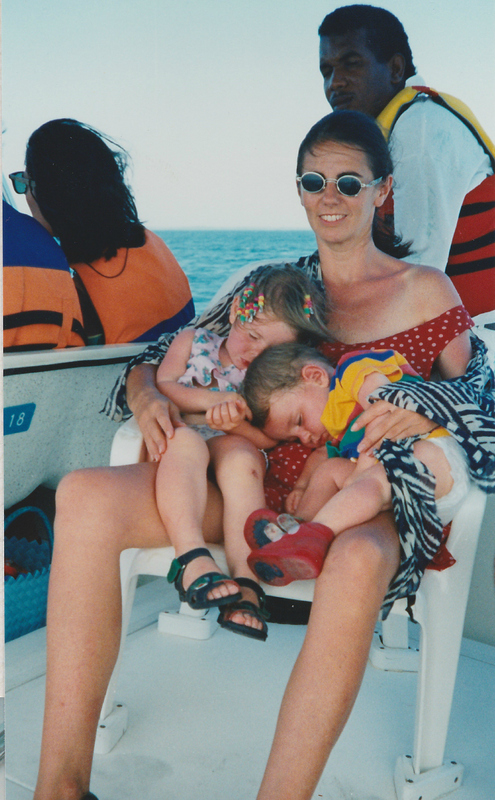 was living in Colombia and we had just spent an enjoyable day out on the sea off the coast by Cartagena. I felt great with that double bundle of sleepy warmth on my knee, I felt n that moment like I could handle anything. Good job we parents have these moments of optimism to see us through! 9 months earlier I had been returning to Bogota from London where I went to give birth to my second child. The 10 hour flight is had gone well, but it’s a challenge to fly with a 12 week old baby and a two year old. The airport had been no worse than usual, except for the extra baggage of all the baby equipment that I had needed during the 3 months in the UK. Somehow I got it all off the carousel, managed not to hit the guy who complained that I wasn’t also holding my 2 year old while I did this, and loaded onto a couple of trolleys. At least they will be there to meet us I thought (it was nearly midnight, it had been a long day). But there had been a miscommunication and nobody was at the airport. Never mind I thought, I’ll get a taxi. We needed a mini van because of the baby clobber, but we set off. Too late I realized I had no local currency – I wouldn’t have needed it normally. There was nothing else for it, I had to ask them to stop at a cash dispenser. And I then had to decide which was the lesser of two evils. To leave my babies and all the luggage in the minivan (in a country famous for kidnappings) or to wake them and get them out then have to somehow hold on to them in a dark street (still in a country famous for kidnappings). I erred in favour of the taxi driver, partly because his wife was also up front. I felt sick nonetheless as I got out to use the ATM. How would I explain this decision to anyone if it went wrong. What went wrong actually was the ATM. I didn’t know that by not using a card for 12 weeks it automatically got cancelled. I got back in the minibus. At least it was still there. So now I it was still nearly midnight (so the next morning already in the UK and of course I’d got no sleep on the plane and I had no means of paying the taxi. This was pre mobiles / cellular phones so I also couldn’t contact anybody at work for help. Thankfully a neighbor in my apartment block – who ‘d never even seen before – agreed to lend me the cash to pay the taxi and even helped me with the luggage (the random kindness of strangers). Thankfully the taxi driver did not take advantage of my situation. And thankfully it all ended safely. That episode was one of many hard choices I have had to make as a parent. That any of us have to make as parents. There may be a queue of people ready to tell you what you should do at each twist of the road, but there is rarely an actual answer, not one you could know in advance anyway. Parenting offers endless scope for being at your wits end yet having to keep your wits about you. Being bone tired and yet still finding the strength to carry the babies home. The opportunities for personal growth are extraordinary. However tough you may be finding it, by carrying on, by putting one foot in front of the other and hanging on to your intuition, your humanity and all that got you thus far, take heart that you are growing your capacities to cope, to love, to make bad decisions and survive them or to make good decisions and be amazed. I’ll be thinking of you.